Small areas of a home invite purpose-specific uses. 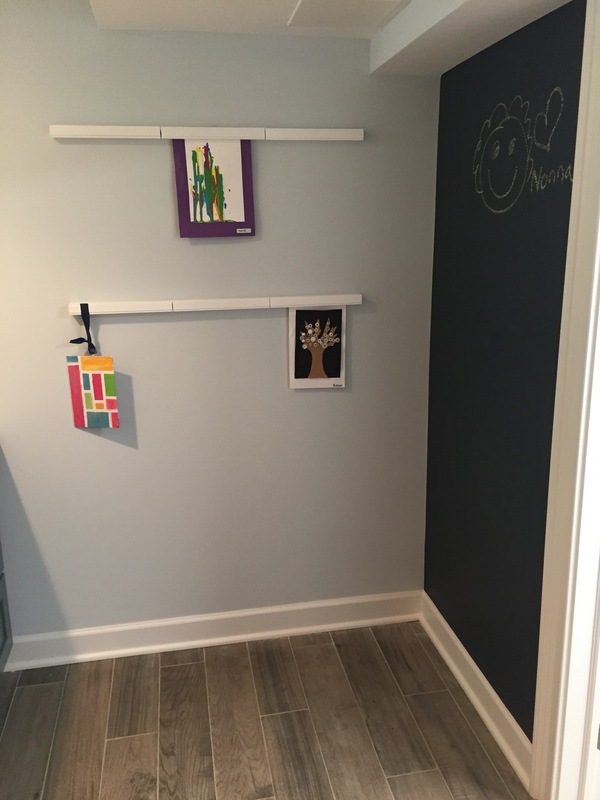 Mudrooms and laundry rooms are typical examples. Other small areas fade into the background. Around 50 SF or less, these are usually found in overlooked areas such as basements, attics, oddly configured bedrooms, wide corridors, and so on. Occasionally, the owner thinks "we really should do something with this, but exactly what?" In this instance, the owners asked us to finish a basement that would serve different age groups in the family. This corner alcove provided a good opportunity for art projects. It measured approximately 7' x 6' with two exterior walls meeting at the corner in the picture below. Only the window existed when we began this part of the project. A desk with a quartz top offers storage and durability to resist paint, markers, and glue. Wall-mounted organizers keep art supplies contained above the work surface. Dual outlets with 4 USB ports accommodate electronic devices and, in the future, the space can be converted to a homework station. Wall-mounted racks have magnetic locks to hang dry art projects. A chalk-board wall completes the 42 square foot space. The default option for basements is usually "more storage", but we think it should be "more living space" instead. A finished basement can, and frequently should, be more than just a storage facility. Using the basement as a genuine living space is a worthy goal because owners can "recapture" under-valued square feet, both for their own enjoyment now and resale value in the future. We'll follow up with the other parts of this basements soon.